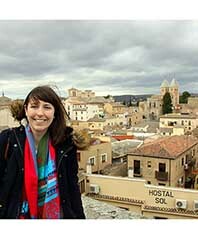 "I recently returned from a semester at University of Navarra, in Pamplona, northern Spain. I decided to do this exchange because I realised the best way to finish my Diploma in Languages and final semester at Monash would be in Spain itself! Living in Spain, with Spanish flat mates and classes all in the language (no English allowed!) definitely threw me in the deep end from the beginning. My first taxi ride over from the train station presented the first challenge, as, fresh from Australia, my Spanish wasn't so good yet and the driver didn't speak any English!" "The first few weeks at the University of Navarra were a little challenging, as students were forced to adapt to studying all their units in Spanish. I was studying six subjects: in conversation, grammar, Spanish art, literature and culture, as well as writing techniques in Spanish. Pamplona, being a smaller rural city, doesn't harbour many English-speaking locals. But pretty soon, bit by bit, I noticed my comprehension getting better. By about a month and half in, listening to and talking Spanish was second nature! Pamplona is located in the north-western corner of Spain, near the border of France and the Basque country. The Basque country has a very green alpine feel and is very different to rest of Spain, a lot of which is quite dry. Euskera, the Basque language, is completely unrelated to Spanish or other romance languages, and predates Latin. Due to this separate language and culture, living in Pamplona was like living in two countries. The Basque people desperately want to separate from the rest of Spain, and although the terrorist actions of the nationalist group ETA have died down for now, a quest for independence continues. A sign in the centre of Pamplona reads "YOU ARE NOT IN FRANCE OR IN SPAIN, YOU ARE IN THE BASQUE COUNTRY!" and the Basque people have traditions, dances, musical instruments and even a fashion sense that differs from other regions in Spain. Pamplona is known for being the town where the famous "Running of the Bulls" occurs, and this happens in midyear, in Europe's summer. During this time Pamplona's population has been known to rise from around its normal 200,000 inhabitants to over a million, the town swarming with tourists primarily from Britain, America and Australia. However, the rest of the year, Pamplona is a pretty sleepy university town." "As there are two major universities in Pamplona, there were plenty of activities for students to get up to, such as the Juevintxos night. Jueves, in Spanish, means Thursday, and pintxos are a Basque form of tapas – making up the portmanteau "Juevintxos." Therefore Thursday night is basically student night where bars provide cheap specials on wine, beer and snacks, where you can buy a pintxo and drink for the bargain price of two euro. This was a good night to get out and hang out with local friends or with exchange friends met in class. My classes were entirely done with other international students, and in them was a motley combination of Americans, Koreans, Japanese, Germans, French and more. My three Spanish flatmates Natalia, Marta and Mercedes, also students at my university, were extremely welcoming and ended up being my main link to young local Spanish culture. I recommend living with locals so that you can really experience what it's like to be a Spanish person living in the country. Pamplona was a little isolated when it came to travelling to other parts of Europe. Some of the exchange students, many of us being from countries far away, had a strong sense of wanderlust and would travel to different corners of Europe on weekends. Travelling to another country (other than France, which was only a two-hour bus ride away) usually meant taking a 4-6 hour train to Madrid or Barcelona, then flying from there. Flights were extremely cheap but train rides usually were not. However, Spain is connected by a good speed-rail system and taking the train around the country was pretty easy. I enjoyed visiting local galleries and well-known institutions such as the Prado with my art class, and the Guggenheim in Bilbao. Having studied ceramics, I particularly enjoyed the south of Spain, visiting the Alhambra in Granada with its exquisite ceramic tiles and also the Alcázar in Seville. I recommend anyone at Monash, but particularly anyone studying languages, to consider undertaking a semester-long exchange overseas, as they will be the most worthwhile six months of language study you'll ever experience. Sometimes living in Australia, it can be hard to get motivated to study a foreign language as everywhere is so far away! But when studying the language in the country, you get to use what you've been learning in class everyday – going to the shops, taking a taxi, chatting to your local housemates or friends. I even had to use my Spanish at some local hospitals - unfortunately I got sick a few times but the fact that most doctors in Pamplona didn't speak English didn't daunt me after I'd been speaking Spanish for a while! But none of this would have possible without the travel scholarship I was awarded before I left for Spain. I had been awarded the Walter Mangold Travel Scholarship for studying a foreign language overseas, to help with the cost of my studies. This travel scholarship covers studying a wide range of languages in country, including studies of Chinese, Indonesian, Japanese, Italian, and of course, Spanish. Monash also awarded me a couple of travel bursaries which really helped, as otherwise I wouldn't have been able to afford to go on the exchange. I not only learnt more Spanish than I ever have while living in Spain, more importantly, the exchange opened up a whole new world of culture, travel and friendship that will stay with me the rest of my life."